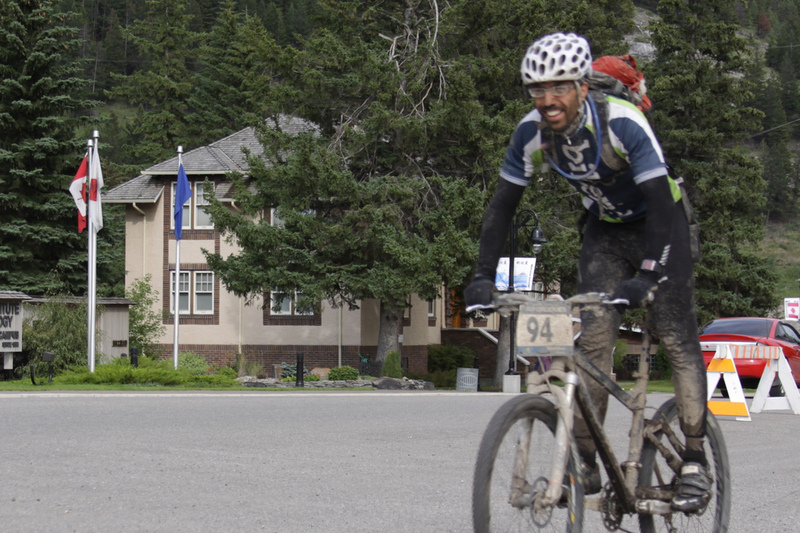 Upon leaving Nipika Mountain Resort, the riders are faced with the longest ride of the 2009, a 107km epic through the deep wilderness of the BC Rockies. The route follows along the base of the Royal Group, with the highest peak in the Range, Mt. King George looking down on their epic ride. The mid-point of the race! Oh, and the longest stage of the race… 107km with 1,980 meters of climbing. I think everyone was a little nervous about this stage. After three days of hard slogging, 107km on already tired legs was going to be a long tough day. For some reason Ken and I had it our heads this was supposed to be a pretty nice day, and the morning started out ‘okay’. Maybe we’d heard it in passing at dinner the night before. I can’t recall. But, nevertheless we didn’t dress for what was to come. Rains came in and were heavy and it hit of high of something like 7 degrees; it would have been colder at the top of the climbs. I remember us riding along through the mud and puddles, both looking like shriveled drown rats. At the top of the pass, the rains let up a bit, but we were soaked through and had to start the long decent. This was a screaming fast section of fire roads that went on and on for miles and miles. It was awesome fun, except without wind jackets the cold was borderline torture. I kept fighting with the decision to either let the breaks go and speed up to end it more quickly, or to slow down and reduce the wind/cold – neither was a perfect solution. In the end Ken and I just grit our chattering teeth and got down off the mountain as fast as we could bear. This left us with around 40km still to go and the rains had picked up again. This entire day was rough, and looking back it really didn’t need to be, if we’d just thought to put on our jackets. But instead, we literally froze the whole day and it was all I could do to not throw in the towel. This is where riding with a teammate is so incredible. We both knew we were hurtin’ big time but we just kept going and as we got closer to the finish and crossed through the canyons on the way into Whiteswan the sun finally came out like a beautiful gift. We learned a valuable lesson on that ride, that’s for sure. Not packing your shell, just to save a little weight = not smart. Despite the elevation, the day held only one major climb; we were going to pretty much gain all our elevation for the day all at once. Despite a dry (albeit cool) start, it turned out that the combined optimism of team Bikeridr was not enough to vanquish the wet, and Mother Nature pretty much dumped rain on us intermittently all day. As the day warmed we started to feel a little bit better and the hard work of the climbs helped us to stay positive. 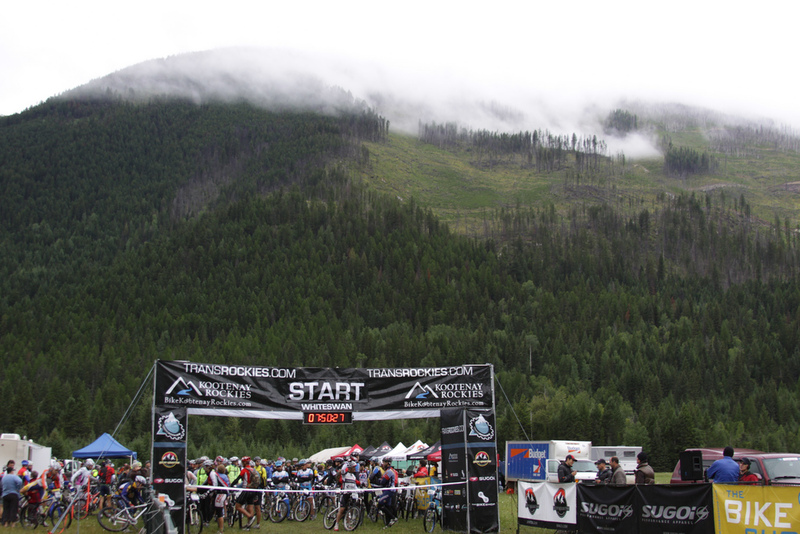 This stage opened up a bit, with generally less singletrack, and more doubletrack / logging roads. Because this suited a different type of riding, we ended up ‘mingling’ with some different teams than we had to date, which was kind of nice. Unfortunately, with the technical stuff being more our strength, we found some of the less technically-inclined teams with bigger engines making some ground on us in this stage. As the day stretched on, the weather didn’t improve and both Sheldon and I found ourselves sincerely fighting to keep warm. In hindsight, I’m not sure that I’ve ever been dumber in the mountains… If the rain or wind had picked up, or the temperature had dropped slightly I think we would have realistically been looking at hypothermia. Why I thought I could roll out without packing a rain/wind jacket is beyond me. Truly a bonehead approach to the day. It was a tough push in, and truth be told, we’re lucky we made it. After three days deep in the Rocky Mountain wilderness with no internet or cellphone coverage, Day 5 sees the TransRockies field ride from the shores of Whiteswan Lake over two major passes into the outdoor sport destination of Elkford. Much of the route travels through the remote Bull River Drainage area before a leg-breaking final climb to 2100 metres on the Crossing Creek route. 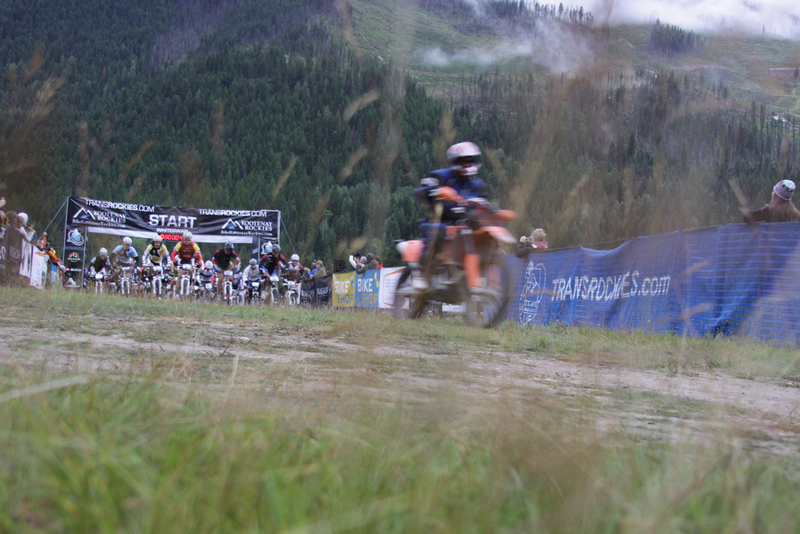 Though the course points straight down at this point, it’s no cakewalk to the finish. The top section of the 800m vertical descent into Elkford is notoriously named the Rock Garden and consists of a largely unbroken steep field of boulders that require momentum, commitment and real MTB skills to negotiate without crashing or walking. 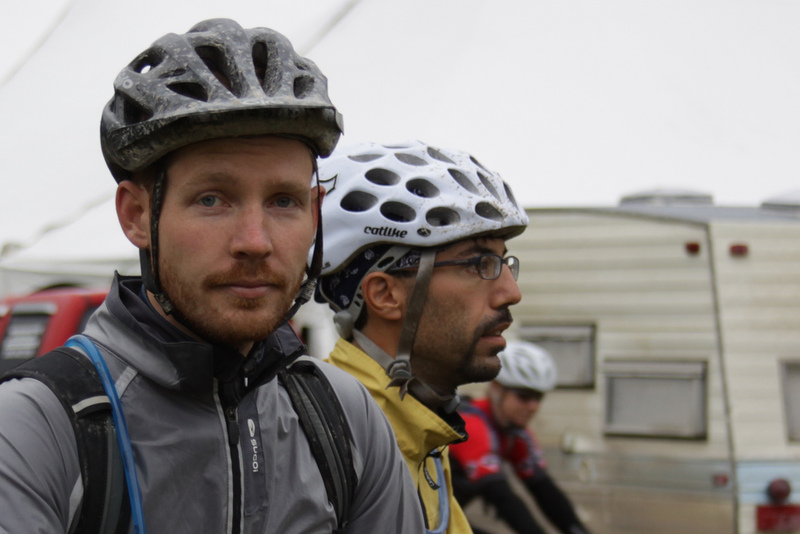 The morning of Stage 5, already four days in, stiff, sore and with diminished energy, I remember staring up at the grey sky and mountains surrounding Whiteswan and shivering… You could almost see your breath in the air and everything was wet – the kind of wet that you feel in your bones. We were set to ride 87.5km, with 2,254 meters of climbing on our way into Elkford. After the day before, I had no idea if I had it in me to get there, but by this stage of the race I was beginning to realize that even though the distances and hours seemed so daunting, my body was managing to somehow get it done; I didn’t really see why this day was going to be any different. Well, despite the dizziness I was trying to ignore. I’d been waking up at night feeling dizzy for some odd reason. That night the tent had actually felt like it was spinning. It was bad enough that I mentioned this to Ken. The good thing was as long as I kept my head upright, I felt fine, so I didn’t want to be too concerned. I just wanted to get on the bike and get going. We had two major passes to go over that day – tons of climbing! Ken and I picked a decent pace and held it for the majority of the time as the rain fell steadily on us all day. I think this was the stage we came across one team that had pulled off the trail and were getting their emergency blankets out. The wet and cold was taking its toll on all of us. Both Ken and I, after going near hypothermic the day before, had dressed a lot better and so Ken gave one of fellows his fleece. Thankfully, this enabled them to rally and finish off the stage. Despite a tough physical and mental push the day before, I woke up feeling pretty good. I had skipped out on the race briefing and awards the night before in favour of a warm tent and more sleep. Looks like it paid off. Unfortunately the low hanging misty clouds marked another ominous start to the day. We definitely weren’t the only team being affected by the weather and as we picked our way through the latter half of the 87.5km we ran across another team that had tucked themselves into the trees to get out of the cold and wet. Things weren’t looking promising as one team member was already wrapped in an emergency survival blanket. Having learned a precious lesson the day before and potentially over prepared for this days stage, I leant the team an extra fleece I was carrying. We were close enough to the end that even if things turned bad I was confident I could tough ’er out. The rest of the ride in was a roller coaster of seemingly never-ending, slick, very technical, rocky ascents and descents. Still feeling good, I simply did my best to ‘clean’ as much as I good. It was actually kind of fun, as all the teams around us would cheer as I crested the tough climbs. Helped to put the wind back in my sails after getting beat up a little mentally the day before. Nice job. The body is so much stronger than the mind – you can go for hours when you think you’re done, just making it to the next landmark or peddling for another 5 minutes. I know exactly how day four felt for you, as we had a few of those on our tour. Sounds pretty obvious, but it’s still amazing to me how rain and few fewer degrees can turn a great day into a nightmare. Keep ’em coming!